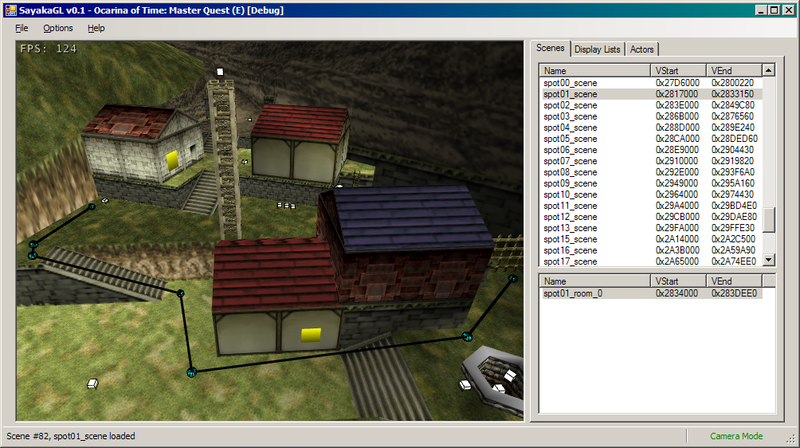 The header commands are designed to define the bulk of the structure for Scene and Room files. 0x07 Special objects 07xx0000 0000yyyy x loads an elf_message file, which determines how the C-Up Navi icon hints work. 00 for no data, 01 for elf_message_field, 02 for elf_message_ydan. z affects Link's idle animation OR makes the room "Too Hot". See here. 0x09 Unused command 09000000 00000000 Has two instructions saving values to the stack, which aren't read before being overwritten. y is the segment offset of the list. Follows the unused lighting list format. 0x0D Pathways 0D000000 yyyyyyyy y is the segment offset of the path list. Follows the path list format. 0x12 Skybox modifier 12000000 xxyy0000 Allows skyboxes to be enabled in some rooms of a scene but disabled in others. y = Sets what location of the world map to highlight. Commands beyond 0x19 are used in Majora's Mask only. Some assets stored within scene and room files are only referenced by external files, or not at all. Textures that are used by multiple rooms are typically stored in the scene file to save space. Entrance cutscenes, triggered when spawning using a specific entrance (referenced by code, possibly Ocarina of Time only). Some actors (Sheik in the Ice Cavern, Saria in Sacred Forest Meadow) trigger cutscenes stored within the scene setup, rather than internally. The Spirit Temple in Ocarina of Time has two unreferenced headers in every scene and room. Each room is two pointers, start and end, which game searches for in the file system. A maximum of 32 rooms can exist per scene without encountering potential issues. s = Room virtual address start. e = Room virtual address end. 01 - Prevents the Sun's Song time effect. 02 - Disables jumping through the action button. y - Show / Hides invisible actors (like Floormasters, Fake Walls, etc). 04 - Link stretches and yawns? 0A - Re-adjusts his tunic? Contains a list of start position and room pairs. Indexed based off of the entrance called by the entrance table. The first byte in the mesh header determines the "type" of mesh information is stored. There are 3 different types of meshes. Simple mesh format; renders all display lists specified. x = display list with opaque geometry. Set to 0 if unused. y = display list with translucent geometry. Set to 0 if unused. This format is used with certain pre-rendered areas, specifically to render a static background image rather than the panoramas. Notably, the JFIF image is rendered via the S2DEX microcode, rather than the primary rendering microcode (F3DZEX). The JFIF is drawn using S2DEX's gsSPBgRectCopy (0x0A) macro. See JFIF for more information on the background image format. Beyond this, the format differs a bit between single and multi backgrounds. /* 0x0C */ u32 unknown; //value never read? /* 0x10 */ s32 unknown2; //value never read? /* 0x08 */ u32 unknown; //value never read? /* 0x0C */ s32 unknown2; //value never read? Mesh that clips if the player is not within certain bounds. A maximum of 15 objects can be defined on the object list. The combined file size of all object files loaded at one time (including the ones listed above) typically cannot exceed 0xFA000 bytes without writing a hack to expand the reserved space. See Objects for more information on this. If a scene has connected rooms, care must be taken when choosing what order to list object files. When travelling from one room to the next, the game will compare the objects that were loaded by the first room to the objects requested from the second, starting with the first object number in each list. When the game encounters a number that does not match, then all object files after the last match will be unloaded, causing any actors dependent on those object files to unload as well, even if the second room contains the correct object number later on in the list. Actors which have a "route" to follow, such as the carpenters or the graveyard boy, do not have the route hard-coded within them. Instead, the points which they make straight lines to are mapped out in a list. That is, a point is marked at every turning point, and they follow straight lines between the turning points. Transition actors are scene level actors that swap the room that is loaded. A maximum of 64 transition actors can exist per scene. Transition actors don't have their own collision, it must be part of the collision specified by the collision command in the scene header. Check out the transition actor page for a list of all transition actors. d = Second diffuse light color [illumination of Link from downside], RRGGBB format. Usually 0xB7B7B7. Each entry is a two-byte exit number, from the game's entrance table (for index values, click here). The length of the list is undefined, the engine assumes all indexes within the list which it asks for exist. Check out the collision format for more information about exits. The alternate header list defines scene or room to have multiple loadouts, called scene setups. Each entry in the alternate header list contains a segment offset reference to an alternate header for the current scene/room, or a null offset. Alternate headers have the same format as a normal scene header. The number of alternate headers is undefined, but there must be a minimum of three alternate header records, one for all four combination of day/night child/adult when you add in the main header. The scene setup number set when spawning into the scene determines which loadout will be used. If the alternate header list command is absent, or the scene setup number is 0, the "main" header defined after the alternate header list is used. If the scene setup number is between 1-3 but the alternate header entry is null, the game will scan toward the lower setup number to find a valid scene setup. If the scene setup number is 4+, but the alternate header entry is null, the game will crash. Scene setup numbers 0 and 1 will use the "main" header. Scene setup numbers 2 and 3 will use alternate header 1.
x sets restrictions on both camera movement and c-up camera usage. For more details on skybox camera attributes, see collision camera data. 00 Scenes without pre-rendered environments that have free C-Up camera control. 10 Shop scenes which have a fixed camera that switches between two views, and lack a C-Up option. 20 Scenes which have pre-rendered backgrounds that can rotate, in which pressing C-Up gives you a bird's eye view. 30 Scenes which have pre-rendered backgrounds that are fixed, and lack a C-Up option. 40 Scenes which have pre-rendered backgrounds that rotate, and lack a C-Up option. y sets the scene's location on the world map. The Grotto/Great Fairy Fountain setting might be ignored.